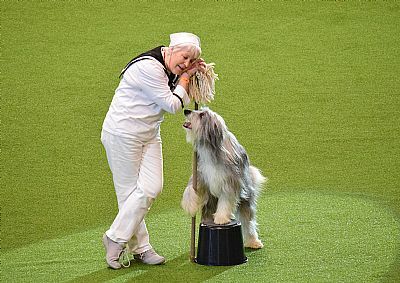 My thanks to Lesley Neville for sending two lovely videos (below) of her heelwork routines with Dewy (Brambledale Blue Dewy)at Crufts this year. To watch them, highlight the title, right click on it and click on 'open link'. Thanks also to Paul and Helen Dennis who made the videos. 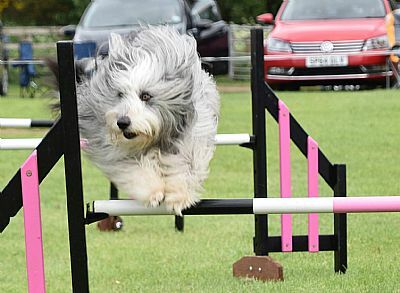 My thanks to Kim Cosans for this lovely birthday picture of her boy, Shiloh, enjoying his agility. Shiloh and his litter mates were seven years old on February 9th. 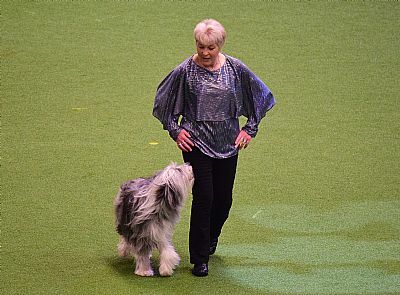 I have also heard from Lesley Neville that she and Dewy (litter brother to Shiloh) will be competing at Crufts again this year - this time in Heelwork to Music. Best wishes to this very successful partnership. 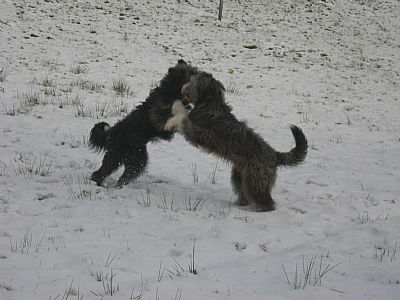 Lesley sent me a beautiful photo of Dewy but it is refusing to upload - I'll keep trying! 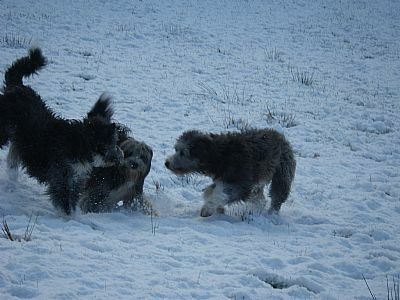 I was interested to see how alike Shiloh and Dewy are now - they look like twins. January and February are always a busy time for Brambledale birthdays - this year we have already seen five of our resident 'home team' add another year, with litter sisters Blodyn and Hanner going into double figures in January, another pair of litter sisters, Mottie and Nell, celebrating their fifteenth birthday on 2nd February and Beatrice (litter sister to Dewy, Shiloh and others) her seventh on February 9th. And, of course, Mottie deserves special congratulations for not only being as lovely as ever at fifteen years old but for also being the mother of two beautiful litters by Glen, including Dewy, Beatrice, Shiloh etc. 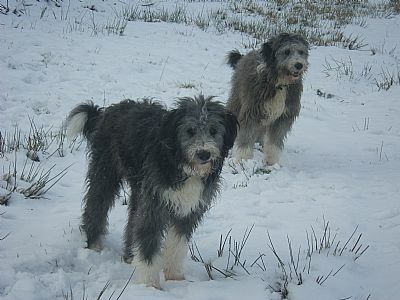 PS The group picture in the top right-hand corner of the main page shows Mottie (front right), with her mother, B Brianna (centre front). The back row shows four more sisters from the same parents :(left to right) Nell, Tiger, Merle and Breeze. 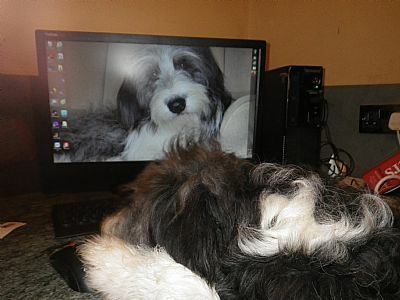 Young Brady has always been remarkably observant and takes a close interest in everything I do - including using the computer, which the other Beardies regard as an irritation which takes up far too much of my attention, which should really be devoted to them. But Brady likes to stand beside my chair, with his front feet in my lap so that he can see exactly what I am doing. 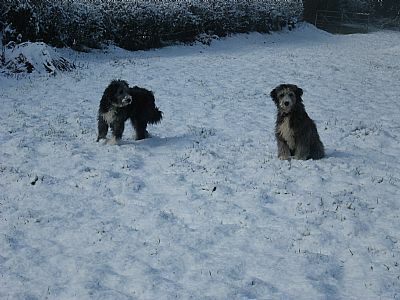 with Brady on left and Bliss on right.